Burak recently asked for a post on RPF loose and strict modes and how they behave on the 7750. I have quit my job so I have been frantically trying to get things finished and handed over and haven’t had time to really test anything for my own amusement. As I will be finishing up tomorrow and won’t have access to any 7750 lab stuff this is a real quick thrown together post. 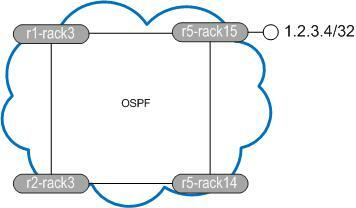 So what does the topology look like from r1-rack3s perspective? and what does r5-rack15 think? r5-rack15 is going to send traffic on the direct path to r1-rack3 but r1-rack3 thinks 1.2.3.4 should be reachable via r2-rack3. Let’s enable RPF on the interface and see what happens (ignore the IntraAS in the name, it’s from another test). Now we send a ping from r5-rack15 sourced from 1.2.3.4/32. As we can see the pings are successful. This is because even though r1-rack3 uses different egress than the received packets ingress, loose allows more flexibility in what the router will accept. Happy days, our check fail stats have not increased. Now let’s enable strict mode and see it all fall apart. Strict mode means you MUST receive the packet over the interface you would use to transmit to the destination. Now when we ping from r5-rack15 to r1-rack3 we should not see a response to our packets arrive. In fact debug router ip icmp doesn’t even show up failed attempts. They’re just ignored. Look at that, beautiful. OK so it’s not a very elegant way of showing how it works but it does. I haven’t found a debug for RPF fails or anything beyond show router interface statistics to display any further RPF information. If you know of any stick it in the comments and I’ll add it. This post will cover setting up OSPF as your IGP, IS-IS will be covered separately. First off we need to enable OSPF. Make sure you have your system interface configured before this point or your RID will be based on the base MAC of the chassis and will look like a public IP. If you forget or need to change the RID you need to config router ospf shut followed by config router ospf no shut. There is no command like clear ip ospf process in IOS. So once we confirm this in place we can go ahead and enable OSPF so let’s do that. The router will use the system address as the RID but we will statically configure one anyway. We will also make the routers an ASBR. This is quite important as simply redistributing prefixes in to OSPF with a policy doesn’t actually send any prefixes to OSPF without the ASBR command in place, the source of many an early days headaches. We will also enable traffic-engineering extensions so we can run MPLS TE, we will need it later. At this point OSPF will be up which you can verify through show router ospf status. If you failed to set your system interface address you will see your funny RID in here. Now we want to configure some interfaces in to the process and we will start by creating area 0.0.0.0. This is where you should place your system interface unless you are a stub area router and not an ABR. The system interface is broadcast type by default and passive so I will set the interface type to point to point, and passive just to demonstrate the command. To create a Totally Stub Area then we put the no summaries option under the stub configuration. MTU obviously plays an important part in OSPF and every network engineer has been mind boggled by it at some stage in their career, exchange start anyone? To set it under an interface its simply mtu # where # is the value you apply. The maximum you can set is 9198, on my routers anyway. *A:r2# show router ospf interface "tor4" detail | match "Oper Metric"
I’m not going to show the output of these commands cos it’s just too much space for a post. So lets assume I have repeated this on 5 routers in the network. We should now have full reachability. 64 bytes from 3.3.3.3: icmp_seq=1 ttl=63 time=5.44ms. 64 bytes from 3.3.3.3: icmp_seq=2 ttl=63 time=3.17ms. 64 bytes from 4.4.4.4: icmp_seq=1 ttl=64 time=8.86ms. 64 bytes from 4.4.4.4: icmp_seq=2 ttl=64 time=3.33ms. 64 bytes from 1.1.1.1: icmp_seq=1 ttl=62 time=42.3ms. 64 bytes from 1.1.1.1: icmp_seq=2 ttl=62 time=3.43ms. 64 bytes from 5.5.5.5: icmp_seq=1 ttl=64 time=4.92ms. 64 bytes from 5.5.5.5: icmp_seq=2 ttl=64 time=3.06ms.